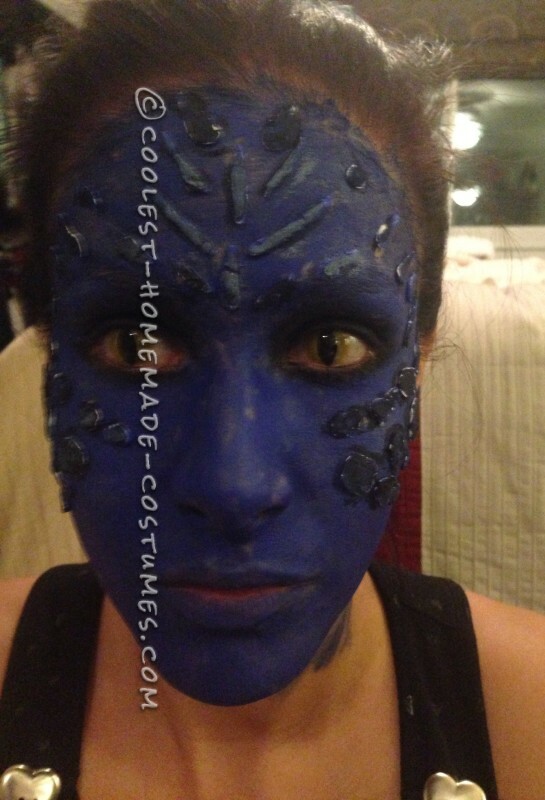 After watching the most recent X-Men movie, I was completely in love with the character Mystique and decided I had to be her for Halloween. I googled Mystique for days and scanned through 100s of pictures to find which ones I would like to use for my Mystique costume. I also looked at other peoples’ costumes to see what they had done in the past. I decided to go with a royal blue unitard because I did not want to walk around in my underwear and deal with painting my whole body blue. I ordered the unitard from a random site I found on Google. 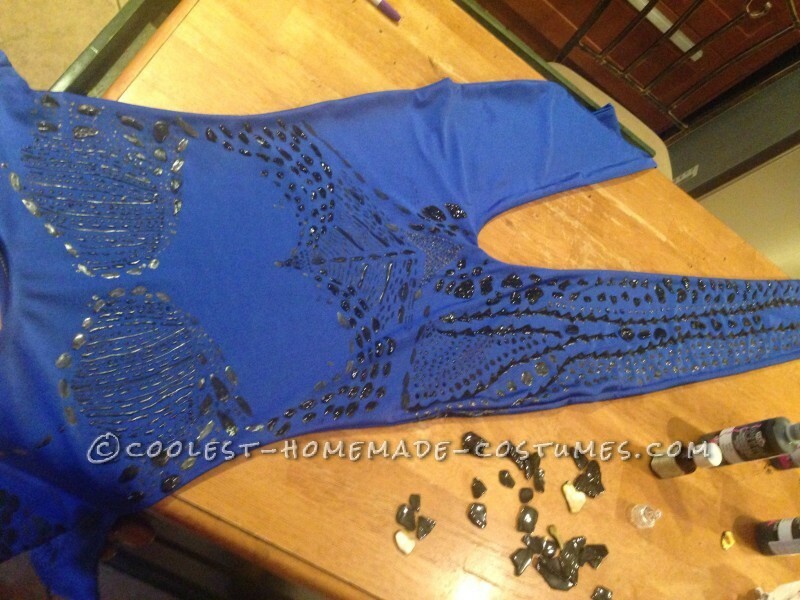 I literally googled royal blue unitard and found a ton of different sites that sold them. I also went to a local costume store and bought tights so even my feet would be blue. One recommendation I would make is, order everything online, the socks/tights and gloves because I later learned that matching the color exactly was a pain and proved to be almost impossible. I then found contacts to make my eyes like Mystique’s. I opted for the yellow cat eye which I regretted later because when I looked closer, her pupil is round; not cat eye, and the whole night my cat eye kept going sideways and I had to keep fixing it. I then had to figure out what I was going to do the patterns on her body with. I decided to go with puffy black paint and metallic fabric paint and alternated between the two throughout the whole pattern. I also bought shells that were kind of shaped like her skin in some of the pictures. 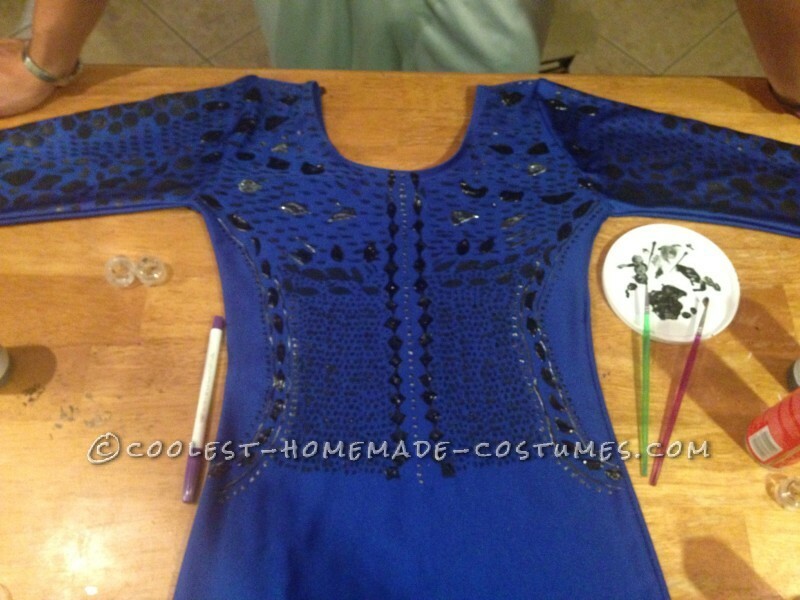 I spray painted them with shiny black spray paint to add another texture to the costume. I would put the unitard on and use a fabric pen to draw the shape of my body so that the pattern would flow with my curves. I did one piece every day and spent 1-3 hours working on it for about 1.5 weeks. 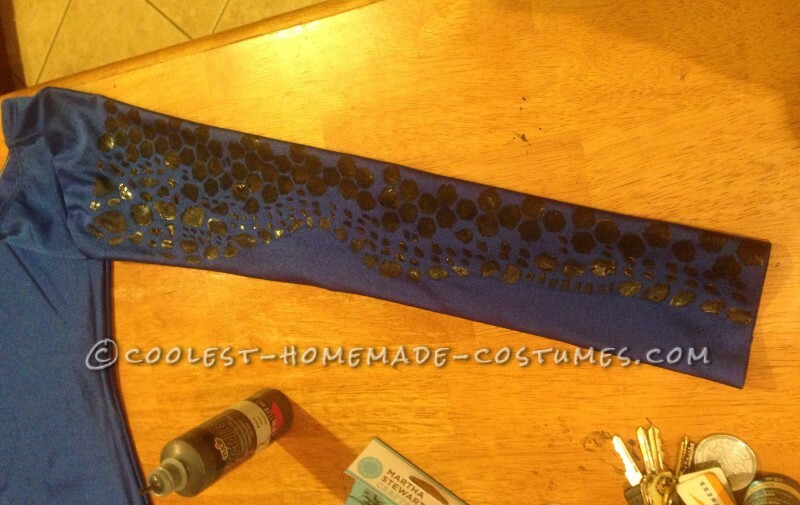 I was completely obsessed with my costume and finishing it before Halloween. One of the hardest parts of working on my costumes was keeping my two wreck it Ralph’s ( my husband and daughter ) away from my costume. They were both very interested in helping but always seemed to smear, smudge or splatter paint where it did not belong. There are actually a few battle wounds you can see if you look very closely. Aside from that, everything was just very time consuming. You have to take your time and be patient. I would finish the arm then have to try it on to make sure it was how I wanted. I followed the pictures I found as much as I could. For my gloves, I tried three different materials. I tried cotton (horrible idea) with acrylic paint. The next day, they were stiff as a statue and you could see the original white color when you put your hand in. I also tried the Silky looking white gloves which had a better effect, but still not quite what I was looking for. The next thing I tried was latex gloves with acrylic paint and that actually worked very well. For the patterns on my hands, I also used the same puffy paint. 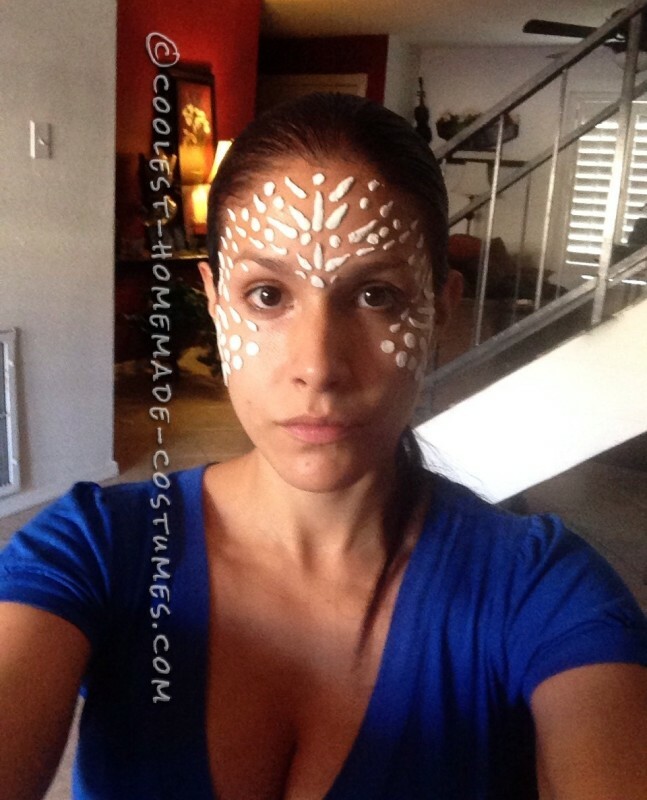 My next obstacle was my face paint. I found a tutorial online and I tried to follow that, but turns out it was a lot harder than the girl made it look. My first try was awful, but luckily, it was just a practice run, so I could try again. I used blue makeup cream that I bought from Walmart and latex I bought from Walmart. The next time, I did the blue base color first, then I used a non toxic putty for children and shaped each individual piece and used latex for skin to get the pieces to stick. This is what I did the pattern with. 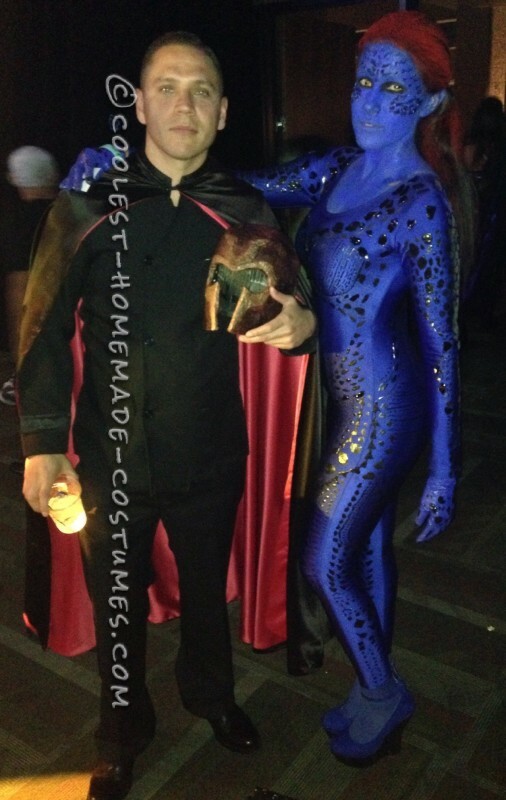 I then painted each piece dark blue to contrast my face paint. I tried dying my hair the color of Mystique’s so I would look more like her but my hair was too dark, so the color didn’t come out. I ended up doing red hairspray to get the color I wanted. When I put everything together, I looked amazing! I have never been a creative person and this time I nailed it. I went to a big Halloween party, they chose 25 contestants and I came in the top five! This was a lot of hours of work put in, but the end result was totally worth it. I now have a beautiful costume I can wear again and I feel proud that I was able to create something so unique. It just goes to show you really can do anything you set your mind to.